Thanksgiving and the holiday season is upon us. Our Georgia Vineyard Fire and Apple Cider Pepper Spread are both fast and easy appetizers served over a block of cream cheese with crackers. However, what do you serve instead of the crackers if you are gluten free or know some of your guests are gluten free? Unicoi Preserves buys a lot of crackers for sampling and we adore the original Ritz but have tried box after box of gluten free crackers that just don’t taste good. Why eat something that doesn’t taste good? So with that in mind, behold! Gluten free and high in protein. Pork rinds topped with whipped cream cheese and our hot pepper spreads. Here’s a fast and easy brunch recipe to help you bridge the gap between breakfast and lunch. A Mountain Cristo is my northeast Georgia mountain interpretation of the famous French sandwich, the Monte Cristo. Preheat a skillet (I used my cast iron griddle pan) on medium heat with a pat of butter in it while you assemble your ingredients. Crack egg into a bowl and beat to scramble it up with a tablespoon of water. To make your Mountain Cristo, simply spread Unicoi Preserves Apple Cider Pepper Spread on both sides of the bread, then build you sandwich by layering in the ham, smoked turkey and provolone cheese. Put the other piece of bread on top and dip the sandwich into your egg wash, then flip it over and dip the other side. Let it absorb the egg like you would if you were making French toast. Now for the fun part! Put your sandwich in your buttery, pre-heated skillet and cook it on one side, making sure to keep your good eye on it so it doesn’t burn. You want golden brown, not blackened! Flip and let it toast. Keeping your heat on the lower side of medium heat is a good plan since you want the interior of the sandwich to be warm and the cheese to melt. I flipped mine around a few times to get it nice and melty. 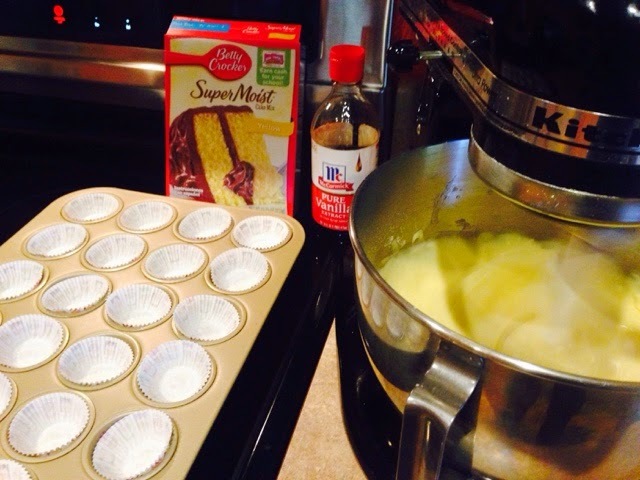 Take out of the pan, slice in half diagonally and dust with powdered sugar. This is a sandwich based on what I had on hand. Prefer a different cheese? Don’t eat ham or don’t have turkey? Change it up and let me know what you used. When you’re a kid, you don’t really think of all it takes to have a family and run a household. We never wanted for anything growing up, but looking back on it now, its because my parents both worked very hard and made smart financial decisions that allowed us to not ever know a birthday or Christmas that wasn’t filled with celebration and gifts. As I got older, I scoffed at my mom clipping coupons and buying store-brand foods, vowing one day, I wouldn’t do the same. Well, fast-forward to today, the apple doesn’t fall far from the tree. I hate for food to go to waste. Hate. We belong to a CSA and get fresh vegetables and fruit in season, so there is a lot of chopping and vegetable scraps that would go to waste if I didn’t have a plan for them. When we lived in south Georgia, we had a compost pile and would put our peelings on that, but since moving to the north Georgia mountains, we have stopped composting because of our neighbors, the bears. I am not afraid of black bears, mind you, but I respect all wildlife and have seen a bumper sticker around town that says “A fed bear is a dead bear.” Basically, bears are lazy and will forage for scrapes of food, be it your trash can, compost pile or camp site — recall the old Yogi Bear cartoons where Yogi would hide out in the campground and steal pick-a-nick baskets. Co-existing with wildlife is important to us and respecting nature and not attracting wildlife to our home by feeding them is a huge part of who we are. With that in mind, here is a recipe procedure, of how to use your vegetable (and chicken) scraps. Garlic, onions, carrots, celery, okra, green beans, tomatoes, squash, eggplant, etc. 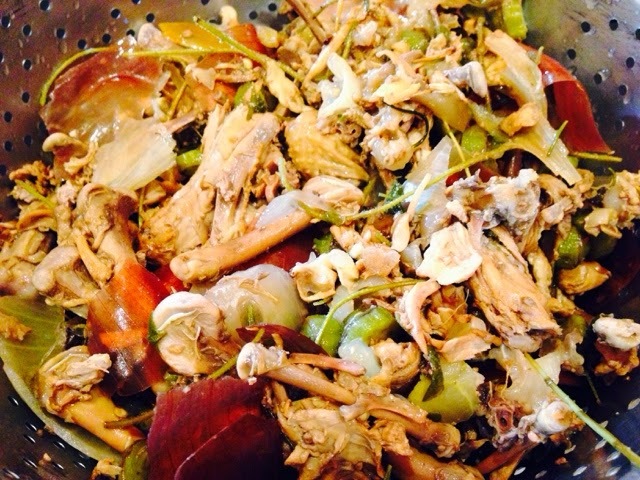 — anything but cruciferous vegetables, they make stock skunky, put the scraps and end pieces in the bag. Chicken parts, like necks, skins, backs, wings, etc. I have left out the chicken before when cooking for vegetarians and its equally yummy. Keep this bag and its contents in the freezer. 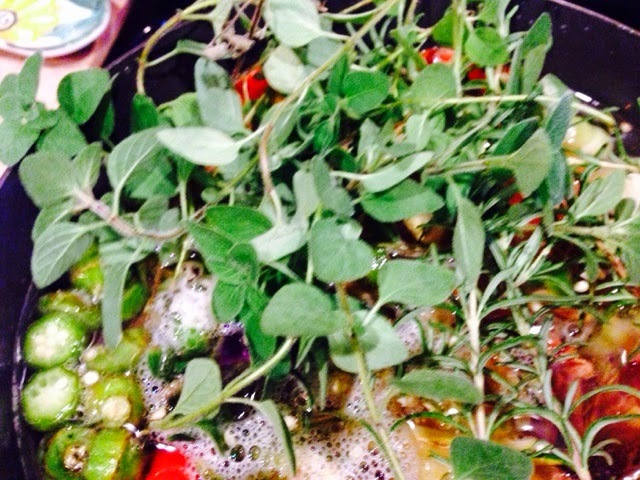 When its full, add it to your largest stockpot and add a big handful of fresh herbs if you have them. I usually have oregano and rosemary. Fill up the pot completely with cold water and bring to a boil, stirring occasionally. Turn the heat down to a nice easy simmer and leave uncovered, cook for 3-4 hours and turn the heat off, cool a bit and strain the stock. If you have 4 legged kitchen helpers like we do, pick through and find some yummy chicken pieces, watching for tiny bones, and make your hounds happy that you are a thrifty cook. 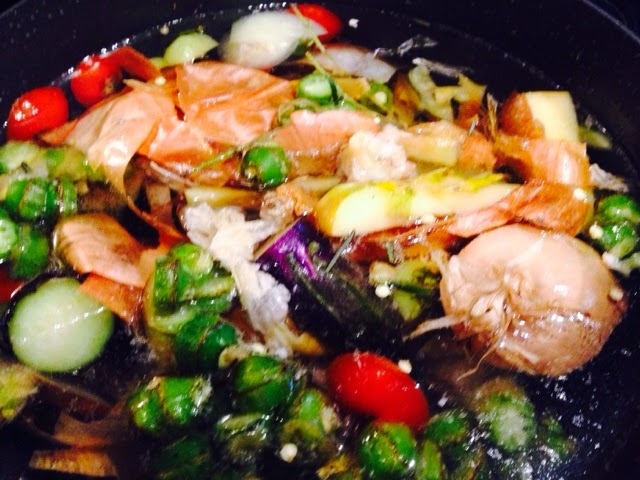 Today, mine made 4 quarts of nutrient-rich and flavorful stock. Usually I freeze it, but since I bought a gigantic candy roaster winter squash, I will refrigerate my stock and use it this week to make soup. 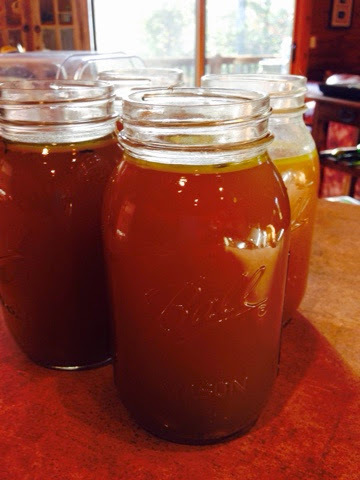 Making homemade stock is easy, let me know how yours turns out and show me some pictures on Facebook, Twitter or Instagram. Growing up, my mom would pack my lunchbox and I was always happy to find the occasional Tastykake Jelly Krimpet. 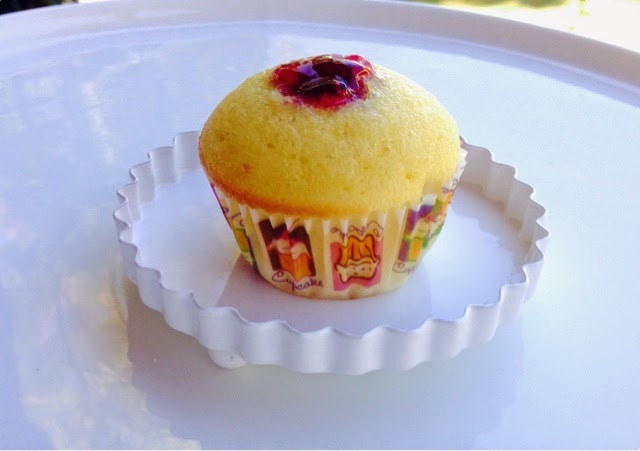 If you’ve never had this fun little snack cake, it’s a simple yellow sponge cake injected in three places with jelly. Vampire Bites are an ode to the Jelly Krimpet. 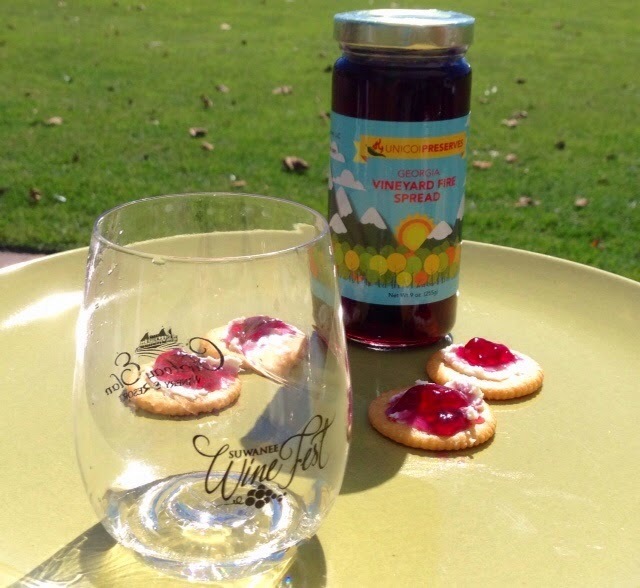 A fast, simple and great way to enjoy our Georgia Vineyard Spread. 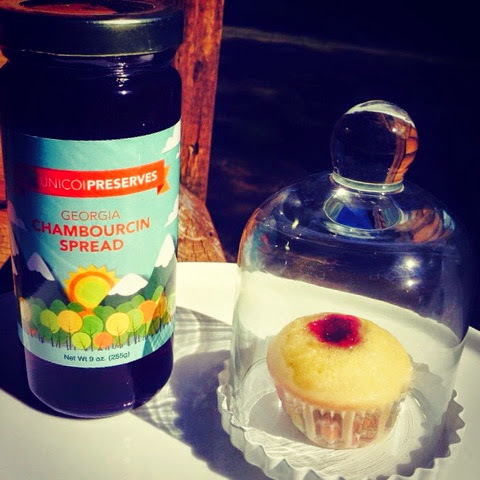 Our Georgia Chambourcin had a name change & is now called Georgia Vineyard Spread. Serve and enjoy. Can make up to 2 days ahead, possibly longer but there are none left 48 hours after making them. Its beginning to feel a lot like Christmas, every where you look! In anticipation of the fast-approaching holiday season, I’ve been looking through my cookbooks and online to come up with some different recipes to highlight our spreads at some special events we have coming up. Here’s the first in a series of recipes that I thought looked really festive! I used both Georgia Vineyard Fire and Chambourcin spread just because of the brilliant color and contrast. We eat with our eyes first, right? I found that the 1/8 teaspoon of jelly that the recipe called for was not enough to fill the indention. Maybe my holes were bigger? 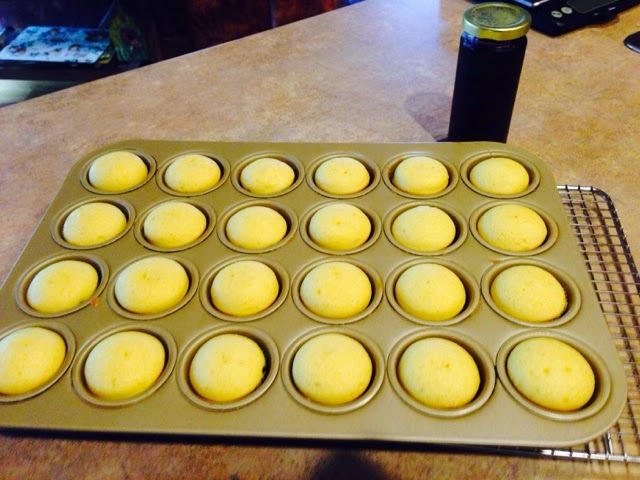 Regardless, don’t make the mistake I made with the first tray, fill up those craters (but don’t over fill them either!) for the prettiest presentation. 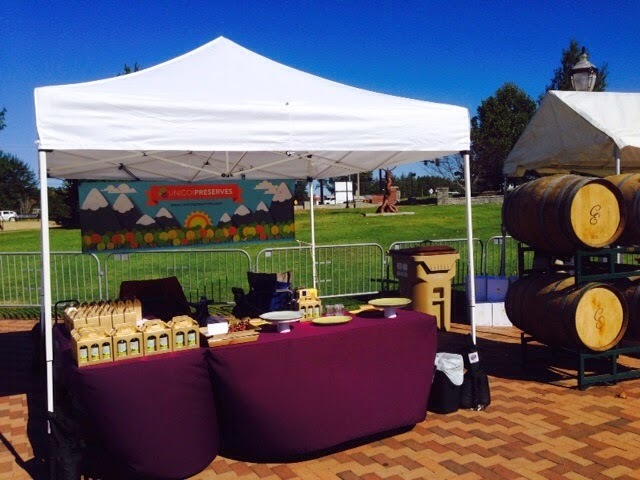 We were blessed with a beautiful but windy fall day for the 2nd Annual Suwanee Wine Fest. Arriving in plenty of time to unload & stage our tent for the festival, we were greeted and helped by many volunteers to get our wagon unloaded and to our assigned spot. This was our first event using our tent weights and the fall crosswinds put us to the test. Once Clark hung our 8-foot banner, the gusts made us wonder if we would get to stay and enjoy the festival or if we’d be meeting folks in the Kansas heartland. 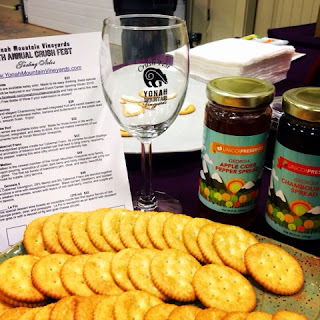 We met a lot of people that had never tried our taste of Northeast Georgia wine country. Clark & I have become pretty good at estimating crowds and based on cracker, cookies & cream cheese that we sampled, upwards of 3000 people were there. 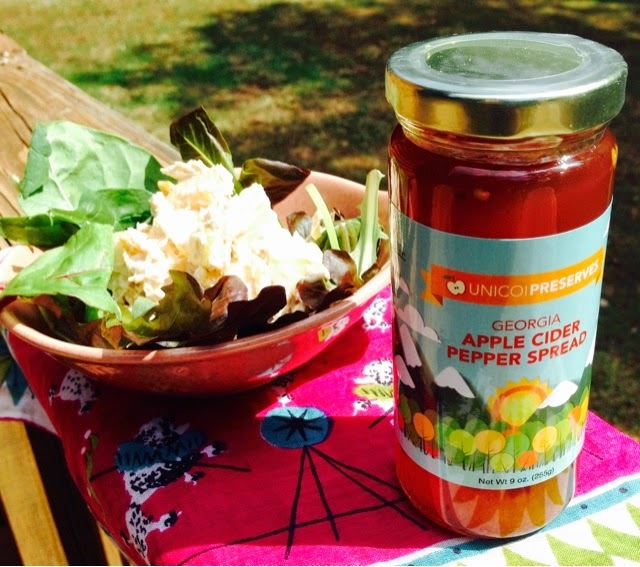 Suwanee really loves Unicoi Preserves and we are looking forward to expanding our market in the area. There were over 200 international wines to sample, a craft beer tent, food trucks and live music all benefiting Annadale Village, a non-profit organization that provides life assistance to adults with traumatic brain injuries & developmental disabilities. Such a beautiful and well maintained park and town. We’ll be back for sure next year, thanks Suwanee! Fall has finally arrived here in the southern Appalachian mountains. The forest is starting to pop with oranges & reds as the days grow shorter and the nights are cooler. We have had a mild summer but its still so much nicer now to sit outside on the deck and enjoy lunch. Apples are coming in from our area and inspired a quick salad for lunch today. Fast and simple, Monday morning cooking here! Chopped rotisserie chicken, mixed with diced apple, onion, and sliced toasted almonds and tossed with a few tablespoons of mayo and our Georgia Apple Cider Pepper Spread. Served over organic mixed greens tossed with a splash of apple cider vinegar and olive oil. As tradition goes, summer’s last big hurrah is Labor Day weekend. 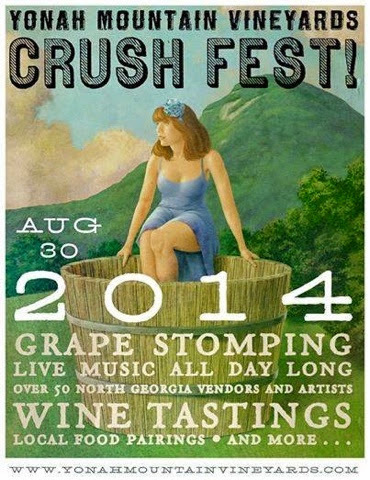 I cannot think of a better way to wrap up a busy summer then with a celebration of the harvest of wine grapes then Yonah Mountain Vineyard‘s Crush Fest. Fine wine, grape stomping, live music all day long, food trucks and vendors made for a fun day. 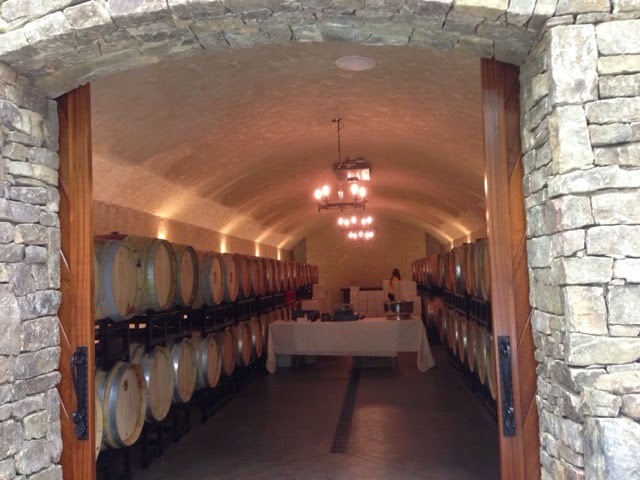 We were fortunate to be able to set up Friday afternoon, so the Saturday morning of the event, we were there at the beautiful vineyard and able to enjoy a little time to walk around and enjoy the opulent and massive tasting room that is Yonah Mountain Vineyards. This winery could be anywhere in the world but its right here in White County (pinch me!) Having been at the event every year since its inception, we knew we were in for a busy day of food demo, so we took advantage of the quiet time and enjoyed a tasty cookie from That Bread Lady of Cleveland. I had laid in plenty of supplies for demo — crackers, cream cheese, cookies and napkins. Such a big shopping cart full of food and was surprised the clerk didn’t ask where the party was at. If she had, I would have directed her to Crush Fest! When the crowds came, they came in force starting around 10 am. At one point, we stopped, looked up and it was 3:30. Talk about time flying when you’re having fun. There had been a chance of rain all day, but we were thankful for everyone that it held off until the end of the event. Some pretty big rain and thunder passed as quickly as it came in. 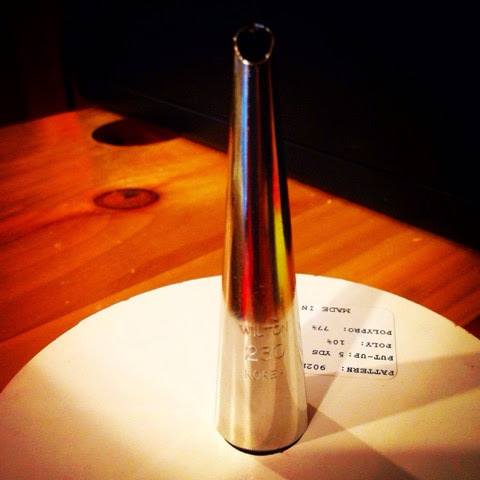 We met a lot of new faces and saw a lot of friends we’ve met in tasting rooms and other events. Some of our fans hadn’t tried our Georgia Vineyard Fire and were instantly hooked. 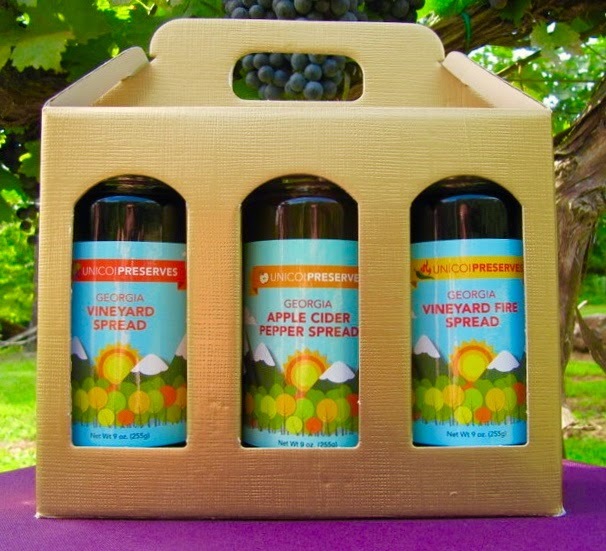 They were also glad to see that we had listened to their requests and we had gift boxes for our spreads at the event and could ship them as well. We look forward to next year’s Crush Fest but we’ll be there again before then and hope to see you there. 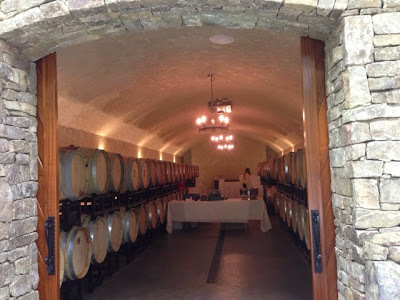 Call and ask about their wine cave tours and live music schedule. We like to keep a full calendar of demo and promotion work on the weekends for Unicoi Preserves, so more and more often, our time has been split between different venues on the same day. The weekend of 12 Spies Vineyard Anniversary celebration was no different. 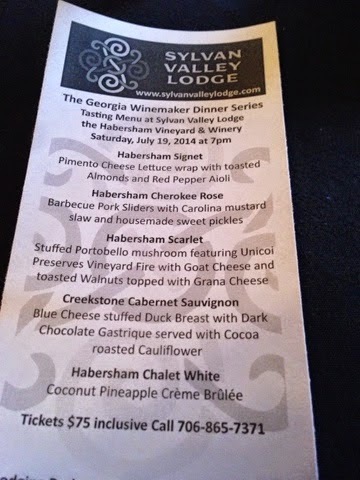 The debut weekend of our new hot and spicy wine spread, Vineyard Fire, was made more special by it being included that evening on Sylvan Valley Lodge’s winemaker dinner menu with Habersham Winery. Thankfully, we had a fast breakdown at 12 Spies Vineyard and were able to get back home, feed the hounds, freshen up and make it to Sylvan Valley Lodge before the appetizer was served. Vineyard Fire loves cheese and made its appearance in the third course. Ginevra & John Boyes of Sylvan Valley Lodge and Chef Rob Rotunno love to play with unusual flavors and pairings for the winemaker dinner series and this evening was no different. 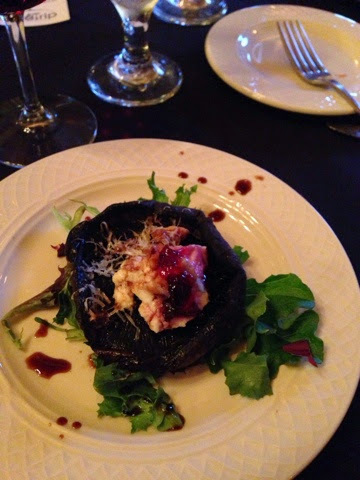 The earthiness of the portobello mushroom with goat cheese and Vineyard Fire with Habersham Scarlett was spot on. Wonderful service, delicious food and world class wines, nothing else like it in White county. Be sure to check out Sylvan Valley Lodge and make your reservation for lodging and one of their upcoming wine dinners. 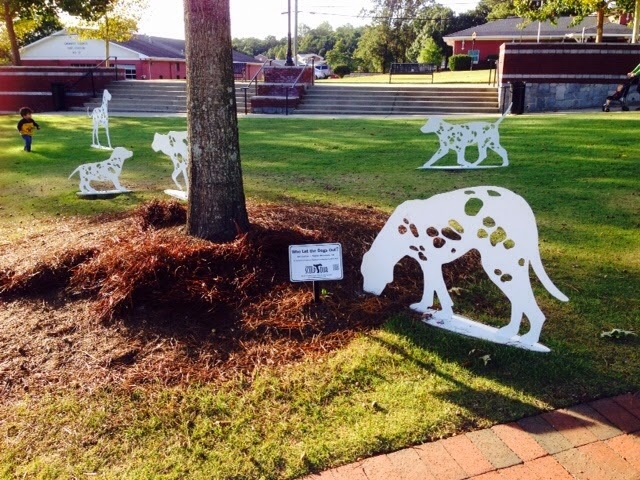 One of the many things I love about living in White county is the sense of community that we have here. A community that works together, supports each other and understands the big picture of working together to make a better place to visit and live. A small community where you see familiar faces at the post office and grocery store and have people hold the door for you, look at you, speak to you, let you out in traffic. Its our mountain version of Mayberry, but with world-class wines, bountiful fruit and vegetables and a network of talented musicians. When there was a tragic fire in downtown Clarkesville that resulted in downtown businesses and employees losing their income, possessions and livelihoods, both White county and Habersham county residents and businesses pulled together and put together fund raisers to help them not only gain some income but to show support and empathy for the loss they had suffered. The wineries and tasting rooms here on the Unicoi Wine Trail collaborate and work together and we were very excited to participate in an evening at The Cottage Vineyard and Winery. Serenity Cellars joined them and together, The Cottage Vineyard & Winery and Serenity Cellars each had 5 wines set up for tasting on the hillside. If you have not been to The Cottage, you should put them on your list. 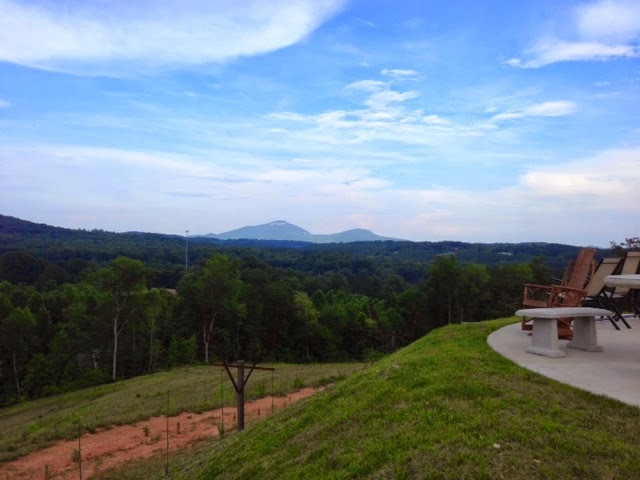 Not only are the views spectacular, their hospitality is second to none, the wines they are making are top notch and their tasting room was just voted Best in White County. Go there! 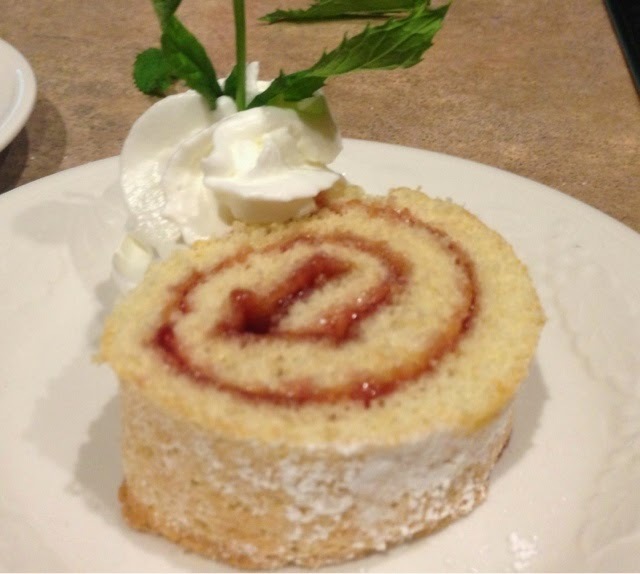 Wonderful live music from Teddy Baker, fabulous and beautiful food from Cindy Gibson of Garden Gate Catering, diverse wines and my famous jelly roll cakes made for a perfect evening.